I hear over and over it’s too expensive to eat “healthy” and you hear it so much, it’s gotta be true, right? I think that’s an “oft-repeated lie.” Stay with me as I prove that wrong with these 12 Healthy Budget Meal Strategies & recipes to go with them. You don’t always have to pay a lot to eat well, and might just save money if you shop carefully and cook at home. Bonus! And it since it’s January and so many of us are trying to recover from holiday excesses (can I hear an “Amen?”) I thought it would be a great time to sit down and rethink a few strategies for breakfast lunch and dinner and give you my 12 Healthy Budget Meal Strategies, options to get relatively healthy AND inexpensive Breakfast, Lunch and Dinners on the table. And I threw in a couple of desserts. January is the time to reboot your diet, your budget & your thinking! We all have mindsets and carry scripts in our head. Take a few minutes to examine assumptions & attitudes about food. You might find you can free yourself up from all the information you’ve been fed by the food industry, advertising industry, as well as old-fashioned ideas that are leftover from the past generations. It’s a big, bold, new world out there! I could go on for days, but below are a few examples. Maybe you know all this; maybe you’ll find something you can use, and maybe you’ll have ideas for me! Vegetables can be some of the cheapest foods. Check store flyers, work your menu around on sale produce. Embrace everyday vegetables. Frozen & canned vegetables might be a bargain but sometimes are pricier than fresh. They also might be a lackluster, last minute add on to dinner that no-one really likes. Know how to compare, how to prepare & know what is the best tasting! Serve more veggies, less meat. Think meatless meals. Combine with legumes or grains & they are higher in protein than you’d ever guess! Myth: I can’t afford healthy food: Ya gotta love ground beef, for instance, as a fast, easy option that can be bulked up with just about anything, pasta, rice and/or cheese to get a fast, filling dinner. I can throw down with that! That’s Midwestern comfort food. From a budget perspective, ground beef from $1.49 a pound for the cheap stuff on sale up to premium lean at up to $4.99 sounds attractive. Right away, you gotta know 20 to 25 percent is a waste for the cheaper stuff & although less fatty, with less waste, the pricey stuff is, well pricey. Embrace healthier chicken, often on sale at a low of $.69 to $.89 cents a pound for thighs & $.99 cents a pound for breasts; it’s a healthy animal protein with little waste. Rethink eggs for snacks and meals. Watch for great sales on the pricier items and serve less by surrounding them with vegetables and grains. Think of proteins as a “condiment” rather than a part of our old “main & two sides” or “square meals.” And don’t be afraid of Canned Salmon (usually its wild-caught Alaskan) and Tuna fish (more sparingly) as budget options. Vietnamese Chicken Salad from Meal Prep Chicken. Turn that mindset around! It’s taking care of yourself just like you take care of your appearance and your home. It’s more important than painting your nails, doing your hair, playing that game or posting on social media. Besides, then you can post great food pics! Always ask, “Am I maximizing my time, effort and money?” Prep ahead, cook larger batches, divide, portion, freeze. Cook smart. Now onto the good stuff! Some of my fave healthier recipes, all pretty do-able, some very quick & easy, others longer cooking but easy to divvy out & there’s a cook once, eat five times meal prep chicken for a week of out of this world lunches. And all are great, no matter what your budget! Like my tagline says, “Recipes so good, no-one will know you are cheap!” And a pro-tip. If you are spending more or eating more one night of the week, make one of my big ol’ pots of healthy and cheap vegetable soup (see lunches) to balance things out! If you follow me (and if you don’t already, I’d love it if you would. Check my right sidebar for Email signup, Facebook, Pinterest & Twitter – I’m done now, with my blatant self-promotion, lol!) you know I won’t be able to stick to just 12 recipes. But I can stick to 12 Healthy Budget Meal Strategies with lots of recipes for Breakfast, Lunch, and Dinner! It’s true. Skip breakfast and we set ourselves up for low energy, overeating later but it’s just so hard sometimes to find the time for a healthy breakfast when we need to get ourselves and maybe kids ready and out the door. And stay at home folks are probably even worse about breakfast than those that drive; at least they might grab a coffee and something to eat. Best Instant Pot Steel Cut Oatmeal – in a jar to tote to work. Think Oatmeal. Make a large batch of any of the longer cooking oats, like Irish Oats, Steel Cut Oats or Pinhead Oats (If you’re curious about types of oatmeal, check Oldways.) over the weekend and divvy it up for a few breakfasts. See Instant Pot Steelcut Oats or use your own favorite method. Microwave your Rolled or Instant Oatmeal; it only takes a minute or two. Ditch the pricey packets full of additives & bring a carton of Oatmeal & a measuring cup to work or divide your oatmeal up into packets. Add dried milk if you like. Have an extra big bowl because we all know it expands. Have a few things at work (brown sugar, dried fruit) divided into small snack sized baggies to dress it up and bring a little fresh fruit from home every morning. Don’t forget Overnight Oats for the ultimate make-ahead breakfast. I give you all kinds of options on my post about them, and many you can do in batches so you’ll have one for each day of the week. Think Granolas. Make any of my “healthier than anything you can buy” granolas. Customize to your taste and always have a fun, fresh option available – use flavors and fruits you love rather than being stuck with whatever the food industry thinks you like. Check out my German Chocolate, my Autumn Almond Pear, Healthy Autumn Coconut, or Gingerbread with Dried Cherries and Pecans. It’s so much cheaper and better for you to make your own. You might even want to make larger batches than I do. It keeps well at room temp for several weeks and can be put in Ziplocs & kept in your freezer for longer term. If you don’t mind more of an investment in time, my Muesli is outstanding. You’ll never buy Familia, the original Dr. Bircher-Benner’s, again. Think Eggs. High protein, low carb, cheap and always fast, eggs should have a place in almost any diet. Eggs are always fast but these Creamy Sheetpan Eggs are super fast & easy and the perfect thing to put in breakfast sandwiches, serve with or roll around healthy items for a grab and go option. These are eggsellent! My Egg in a Mug takes just minutes and you have so many options to make them as healthy as you’d like. You might already make something like this. My brother does and gave me the original idea but I’ve rolled with it and expanded the concept. Here’s a Healthier Energy Bar, reworked for a better carb to protein ratio. They’re not low calorie but are healthy, wholesome and nutritious. You gotta have something to stick everything together and that’s where the dates and a modest amount of sweetener come in. As long as you’re making them, make several batches, wrap each bar in parchment or waxed paper, bag and freeze. My go-to lunch is almost always leftovers. I love love love me some leftovers. Check this page on Making Use of Leftovers & scroll to the bottom for links. Leftovers are trendy with the focus on food waste and “meal prep.” Meal Prep can just be cooking something and dividing it into fancy containers. That’s just fancy leftovers, right? But there is a psychological component to eating something in a fancy container and if that gets people eating leftovers I’m all for it. In the meantime, here are some other great, healthy and (fairly) inexpensive ideas! Think Soup: Buying cans of soup? It’s an inexpensive option compared to going out for lunch or grabbing something fast from the nearby food court or fast food place. But canned soup limits you to their flavors, isn’t always exciting and might have strange ingredients and/or be salty. Make your soup at home! You’re gonna find that sometimes you can make a whole pot for the price of one can of soup! That does vary, and I have a ton of options on my Soup, Chowder & Chili Menu. I want to highlight the cheapest & healthiest soups that are also easy, and these all freeze well. Hint: Think meatless & be prepared to chop on some of these! Here’s Instant Pot or Not Tomato Soup, Original Fat Burning Soup, Thai Red Lentil Soup, Classic Vegetable Soup, and Tomato Zucchini Bisque. Think Sandwiches: You might be picking up sandwiches or wraps at a store or deli – now you can stop! Nothing’s easier to make than a sandwich and you can use those healthier, thin, whole grain buns or just serve in a bowl. Check the carbs on wraps, even if they’re healthy looking and green. They are dense & might have more calories & carbs than bread. Many sandwiches, even healthy ones aren’t always low calorie but these are bang for your buck calories. Binding fillings with hummus or chickpeas is a healthy option and Classic Egg Salad or Healthier Tuna Salad, even with a little mayo is healthier than you might think. I love my Health Nut Avocado Sandwiches, this Southwestern Chickpea & Avocado Sandwich, Vegetarian Hummus Wraps, and a bit pricier but so delish, Salmon & Guacamole. Think Salads: The mark up on salads is 10x what you’d pay to make. It can get cray cray if you pick up a salad every day, six to twelve bucks. That money can buy a LOT of ingredients. You are usually ahead if you buy all the ingredients for a salad (at a decent price) & make one salad, then toss all the rest of the perishable veggies in the trash. Shocker, huh? Ok, don’t do that! Plan out several salads, and coordinate the ingredients so you’ll use them up for the week. Here’s how I’d mix and match to use a big bag of spinach, all different so you won’t get tired of this salad week! Cut them back if you’re cooking for one or stretch one or two of them over the week. My salads aren’t always the cheapest because they need to entice, but they’re an investment in your health: Roasted Cauliflower & Chickpea, make the day after you have roasted cauliflower for dinner. Spinach & Quinoa; cook up batches of Quinoa and stash in your freezer and you’ll use up more of those chickpeas, too. Let’s use more spinach & make extra chicken for this Warm Chicken & Mandarin Salad. Toss some of that extra chicken (and use spinach instead of lettuce) for Chicken & Fruit Salad. Double down on that Quinoa with this Southwestern number, made for late in the week with sturdy stuff so you won’t have to shop. Coordinate lettuce, greens or cabbage salads in the same way. Think Real Deal Meal Prep: You deserve great lunches and that’s going to keep you on point! And while leftovers are fabulous, there’s no denying that no one wants leftovers for every lunch. I’ve worked with chicken for prep-ahead week and you can follow it or go rogue with this concept! To me, Meal Prep looks like my Meal Prep Chicken, cook once, get five varied pretty healthy lunches for two, all made in a couple short hours, complete with grocery lists, prepping instructions, shortcuts and recipes that all co-ordinate. It’s an investment in time, no doubt but you’re worth it. 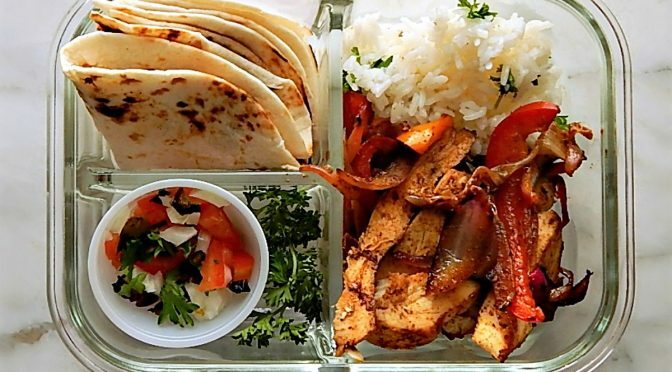 No one will feel deprived with any of these meals. And if you have littles, you might find this post especially great because once you have a fabulous lunch, you won’t have to think about kid-friendly till dinner. I might do more of these posts if people like them. If I can find a dinner that’s easy, fast, healthy & cheap, I think I’ve hit the motherload! I’m just about as happy with a long cooking weekend item that gives leftovers to repurpose through the week or a big batch of something to divide and freeze so I can pull it out later to make a meal. And guess what? I know every recipe on my site and I know the ones that make the best reheat leftovers! Think Large Batch For Meal Prep: There’s no doubt that it’s easy to be seduced into grabbing something on the way home, especially if you have had a bad day, you’re running late or there are time constraints. I try to keep something in the freezer, and if not a whole meal or two, at least a few components that I’ve cooked and portioned out to make a quick meal with. I love these Chicken & Ricotta Meatballs that can be served so many ways! I make huge batches of them. There’s my large batch of the Pueblan classic, Chicken Tinga that can be put to so many good uses. This super simple Instant Pot Chicken Tinga is a great option, too. I already mentioned my Meal Prep Chicken. Chicken Shawarma makes a lot and goes far, but it does call for some special spices and & I show it with a lot of accompaniments. You can go simpler! Honey Barbecue Chicken is done in the Instant Pot or the Slow Cooker and is a huge batch to divide, freeze & use as you wish. Slow Cooker Honey Lime Chicken makes enough for a meal or two or more depending on how it’s served. If you’re thinking Beef, Ropa Vieja is a fun option, I love Vaguely Vietnamese Pork with leftovers for days, but check my menus for beef & pork for pulled pork and roasts. Think Fast & Easy: Dinner should be a tantalizing adventure and when you’re watching budget and/or calories you want to keep it fantastic so you don’t ever feel deprived, amirite?! And if you spend too much for dinner, make a big batch of one of my dirt cheap vegetarian soups (see lunches) the next night to balance things out. Here are some of my absolute fave quick, fast & easy dinners to toss down and they’re all delish – and they’re even better for being quick! Leading the list is my fave minutes to make Thai Coconut Chicken Curry. Shrimp isn’t the cheapest but shop well and make this Shrimp in Curry with lots of bell peppers with cauliflower rice. You can’t beat Salmon for quick & healthy. Make my Salmonchanted Evening Packets & learn how to bring it on a budget. Getting more real, canned Tuna can be fab if you make this Tuna & Green Bean Salad. Go meatless with Summer Squashes with Herbed Yogurt. I’d put down my chicken wraps, but I gotta tell you about Larb – a Vietnamese Meat Salad. And you don’t wanna miss this Rosemary Brined Chicken. Think Dinners that Divide: We talked about Large Batch Cooking, but here are some of my fave healthy dinner recipes that are great for divvying up into portions and they’re all recipes that are fantastic the next day, or the next. Let’s face it some things aren’t so hot leftover; not so with these. And I know I dissed ground beef earlier, but this Unstuffed Cabbage Roll Skillet? Amazeballs! I would seriously eat that cold from the fridge. My Chicken Chow Mein is a perfect thing to serve later. If ya gotta have beef, here’s an old school, not sweet & Healthier Mongolian Beef. You can use just about any shredded chicken or make some just for these Chicken Tacos with Cherry Chipotle Salsa. I like to make extra Grilled Southwestern Chicken & use the rest for a bowl or sandwich. Tyler Florence’s Ratatouille just gets better and better. And you gotta know a frugal blogger is a big fan of beans! Here’s my White Bean Ragout. I “shorted” the four strategies on dinner – there’s plenty of options, right? Coz I needed to save room for dessert. I don’t have a lot of “healthy” dessert recipes. I just eat the best dessert I can IF I have dessert. But a few are just very good and won’t do too much damage. Think Natural: Generally, the fewer ingredients, the easier the recipe, the healthier it is! Well, there’s always Angelfood Cake! I’m not a fan of using sweeteners or anything with a lot of additives so you’ll probably not see that anywhere on my blog – but that’s only my opinion and what do I know? I drink diet pop, a habit I’m ALWAYS trying to break. But here are some of my fave desserts that aren’t gonna kill ya!! I love these Pears with Balsamic. So simple and good. I know it’s winter but these creamy Buttermilk Popsicles are just outstanding and might redirect those ice-cream cravings. My Mom’s Chocolate Cake is lighter but you’d never know it and is great even without frosting. And of course, there’s Aunt Mary’s Angelfood Cake. When you are watching your diet you miss crunch! Or at least I do. These Black & White Biscotti won’t do too much damage. If you can limit yourself, lol! I love these Individual Apple Crisps and they can be made with a whisper of sugar and a touch of topping. Boy, did I pull some old recipes out there, some from my first days of blogging for this post on 12 Healthy Budget Meal Strategies. Be kind! I think I’ve made some progress with writing and photography since then, but I see some “redos” in my future! Luckily most are pretty healthy and won’t break the bank and it will be fun to revisit! And of course, seeing some of these cringe-worthy photos makes me want to thank, again, everyone who’s been there for me and followed me and supported me through good and bad, thick and thin, no matter what my pictures looked like. Thank you! You inspire me! One thing I’ve learned in doing this post for 12 Healthy Budget Meal Strategies and since my stay with the folks with their love of old school food is to make meals that nudge you towards healthy and make meals that can be added to; served basic for those that won’t tolerate certain items and flexible enough to add on healthy stuff. See Dad would eat just about anything but loves his beef and Pat wouldn’t touch a vegetable, salad, soup, beans, legumes, and so many other things. And she’s 92! Dishes with noodles or rice went over well. Anything soft, lol! For this post, I deliberately didn’t highlight any recipes to speak of that had a lot of carbs, noodles or rice, (sorry Ramen!) although both are great budget-stretching strategies. Going forward I’m feeling more vibrant dishes, more flavor, more veggies, and herby sauces. Not Keto so much as recipes that are well balanced and lower on the carb scale. Well, I AM already thinking about my Mom’s brownies but I’ll try to hold off until Valentine’s day! I hope you’re having a wonderful year so far! Hope you enjoy some of these ideas & dishes, too. This entry was posted in Click here for Bargain Meals, Click here for Fabulous Food Posts. Bookmark the permalink. Thank you for the ideas! Budgeting is a huge deal for me this year! I’m excited to try these out! Hi Cassandra, and thanks for stopping by and commenting! I’m glad you enjoyed it, and you’re not alone! It seems every time I step in the store lately I’m paying 40 bucks and buying nothing, so I’m watching things carefully! Yeah, I spent 57 bucks today and my cart that had mostly fresh food products…I was utterly stunned. Love this post! Definitely makes you think about meal planning in a budget-friendly light! Thanks! There’s never just “one” thing in saving money. It’s like a dance with lots of steps! Great tips, Mollie! I currently eat oatmeal every morning for breastmilk supply, but I used to make my own granola and loved it! Though now, I’m looking at the photo of your chocolate granola and all I want to eat is a big bowl of granola with almond milk haha. Hi Ai! Congrats, I didn’t know you were a new Mom! Obviously I haven’t stopped by enough!! I will be over! I agree Mollie, for us eating healthy means lots of veggies and lean proteins. But do we always eat that way, well no not in the past, but we are now. Making time to home cook, in my mind that’s a choice. I think it can make such a difference as we age – keeping those blood vessels working well is so important! One of your absolute best posts. This is information that anybody can use. I did want to suggest maybe you can tell people they can also rinse their canned vegetables, which makes them a bit healthier because they’re getting rid of all of that sugar. I’m going to repost and share this with everybody because it’s so awesome. Great hints that everybody can follow. Thank you so much! I worried about this post a lot. I thought it was too long, yet it contained a fraction of what I’d like to say! How CAN that be, lol! And rinsing is a great idea! I would have loved to go in to what I think are the best tasting veggies and best values in canned, frozen and fresh! Maybe that will be a future post! In the meantime, I appreciate the share and the repost!! Everything on your website looks so delicious. I want to try your egg in a mug, Thai lentil soup and if that chicken tinga tastes like the chicken tinga I got at a Mexican place next to a subway station in L.A. you will be my BFF forever. That was the most delicious chicken taco I ever had in my life and I wondered how they make it. Thank you so much! Then you want the Tinga de Pollo one; I have two Tingas on my site but the Tinga de Pollo is the real deal!! If you try it and love it, I’llhave to let you know when my birthday is, lol!! Thank you! Noted and bookmarked.